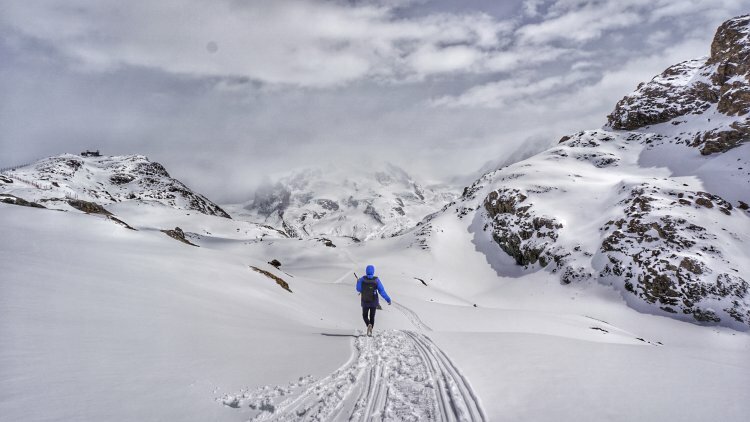 Getting found online is easier and more fun with Klusster. Why? It's more fun to market together than it is to work alone. If you are new to the world of online marketing, there are two basic keys to successfully building business online. 1. Consistently produce great content. 2. Consistently get this great content distributed from multiple sources. That being said, consistent and affordable distribution is easier said then done. No so any longer, with Klusster! To get started on Klusster, publishing articles into a Klusster portfolio is a great start. Businesses will be well on their way to using the more powerful functions Klusster has to offer to increase online exposure. 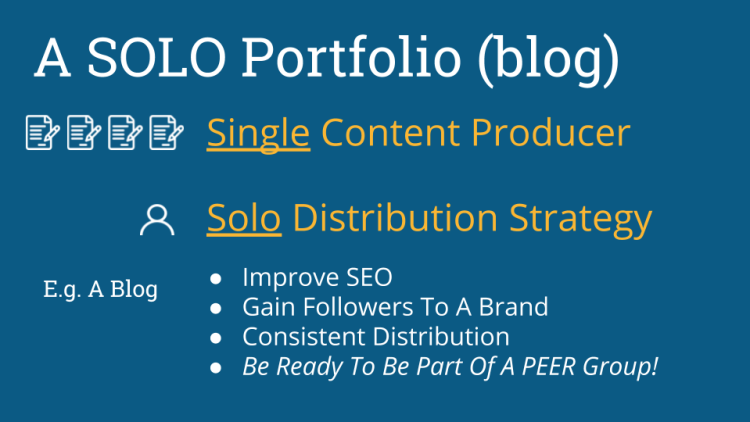 However, with a SOLO portfolio, the single author will for the most part have the responsibility to get found online. This is the case with most blogs. You have millions of blogs and millions of people being the sole distributor of the content. Some bloggers are INCREDIBLE, but most of us, don't have the ability to reach a critical mass so we need to consider other options. Back to the SOLO Portfolio. Many Klusster users upload content to a portfolio to affect their SEO, and they quickly realize, they can do more with their content by working in some form of a group. 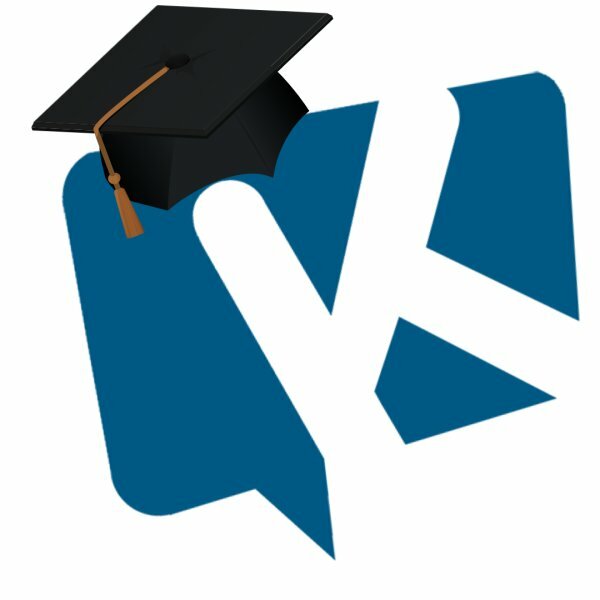 Click HERE if you want to see a SOLO Portfolio in Klusster. Taking your content from your portfolio and placing it into a branded publication will allow you to take advantage of the Klusster Sharing features and increase distribution by creating a GROUP or TEAM to help you get your message across. 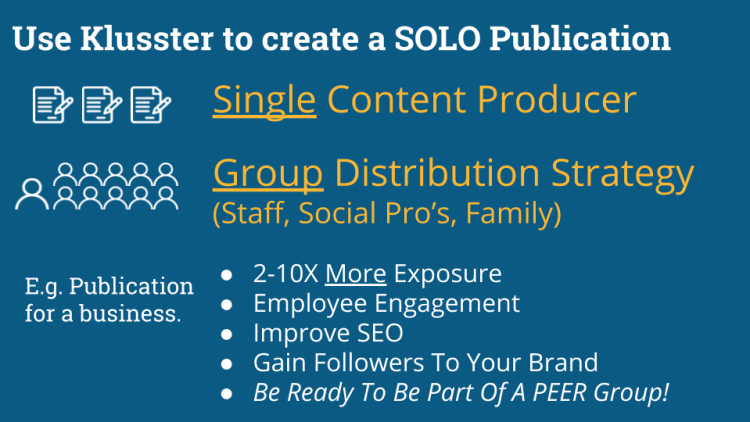 Increase readership by adding team members to distribution. A good example of a successful SOLO Publication occurs when a single business with an engaged staff or even a group of franchisees work together to spread the word of the company through combined social. If you have a group that wishes to be affliated with your success, a SOLO Publication can be very effective. 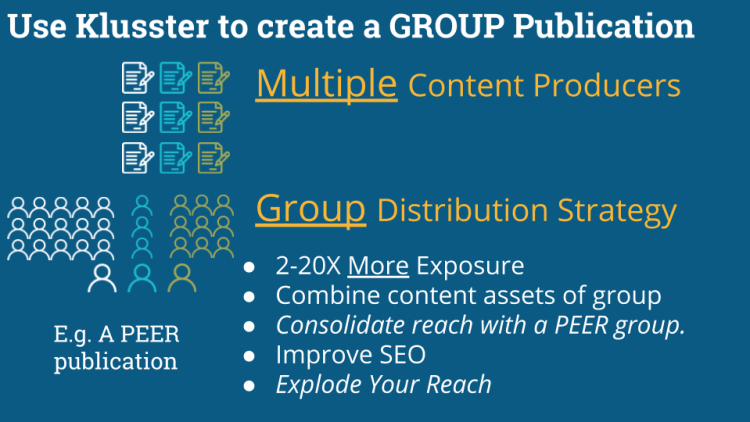 A PEER publication occurs when multiple Klusster users combine their content and distribution assets to reach a much larger group. Creating a PEER publication brings EVERYTHING together. Multiple content producers, multiple distributors in a publication, are extremely powerful when everyone is working together. The above 3 brief examples allow you to see the 3 basic ways you can build a Klusster. Within each format, there are modifications that can be used by a multitude of industries. Auto Dealers, Fitness Organizations, Franchise Owners, Distribution Companies, Non-Profit Organizations, MLM organizations, Business Improvement Areas can all utilize Klusster to reach more people online. See how you can integrate Klusster into your online marketing ritual. Register For Our Next eMarketer Webinar! Sign up for our next Webinar Wednesday where we will guide you through creating a publication for your clients or a group of clients to help them reach more people online.